Smart contracts are powerful virtual referees for holding money and carrying out agreed-on procedures in cases of disputes, but they can’t guarantee privacy and have strict scalability limitations. How can we improve on these constraints? Here at the Center for IT Policy, it’s the first event of our weekly Tuesday lunch series. Speaking today is Professor Ed Felten, director of CITP. Ed served at the White House as the deputy U.S. chief technology officer from June 2015 to January 2017. Ed was also the first chief technologist for the Federal Trade Commission from January 2011 until September 2012. What is cryptocurrency? Ed describes a situation where Alice wants to share money with Bob. She digitally signs a data structure indicating that coin C should be paid to Bob’s address, and she sends it to the Bitcoin network. The systems in the network then gossip to each other that Alice wants to pay Bob. This brings us to the blockchain. The blockchain is a data structure that includes information about transactions and a link to a previous block. Each block includes a cryptographic hash to the previous block, and if anyone accepts the block, they accept the rest of the chain. When Alice creates a transaction, it will be added to a block by a bitcoin miner. This miner then tries to succeed at getting their block to the blockchain- if the miner succeeds, then Alice’s transaction is accepted and it will be deemed to have happened. That’s how Bitcoin works- it keeps track of all previous transactions, and that’s how it keeps track of currency. Smart contracts are another blockchain idea- but it’s a misnomer. Here’s how it works. If Alice and Bob want to make an agreement and have a protocol for carrying it out, they write down computer code that defines the behavior of a third party. One way to do it is to have a trusted third party carry out that protocol. A smart contract creates a virtual third party, writes code describing what it should do, and then instantiates it into the blockchain system. Then, if all goes well, the contract will behave according to its code, and it will act as the third party or referee in the agreement between Alice and Bob. Ed shows this with a pile of money because one thing it can do is to receive coins, own them, and do whatever with those coins that its code has defined. The contract, in this sense, is a trusted third party expressed in code. What can smart contracts do? One option is escrow. Maybe Alice wants to buy books and doesn’t want to pay until she receives the book– but maybe the shop will only ship after payment. This is typically what an escrow agent does. In the optimistic case, the escrow agent receives the money and transfers the money to the shop once the books have been received. Smart contracts can play the role of the escrow agent. Why set this up in code? In theory, an escrow agent defined in code will be less likely to carry out fraud. The most popular smart contract system is Ethereum, in which all contract code and data is public. Every miner emulates every execution step of every contract. That is slow, expensive, and doesn’t scale, so Ethereum requires people to pay what they call “gas” – in exchange for computation and storage done by a contract. The high cost to the miners of emulating these steps translates to a high cost of gas. Contract complexity on Ethereum is capped by a “global gas limit” – defining the maximum amount of contract work that the miners are able to do. Roughly speaking, Ed says, the total computational capacity of Ethereum is less than a tenth of a laptop. These scalability limitations make many protocols impossible, and blockchain space is very limited. Ethereum also has privacy limitations- Bitcoin scripts and Ethereum code are all public. Not everyone wants the full details of every contract to be visible to everyone. In some cases, you might want something more like a traditional business contract, where the contract terms are normally only known to the parties. 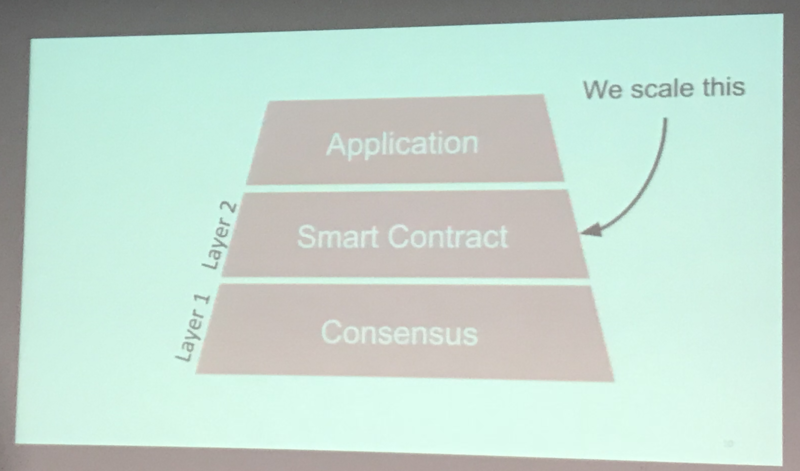 Can we scale smart contracts? That’s what the Arbitrum team was trying to do. To make clear what the team is doing, Ed describes three areas where someone could do work. Rather than focus on the consensus level, the Arbitrum team focused on scaling the smart contracts. Kalodner, H., Goldfeder, S., Chen, X., Weinberg, S. M., & Felten, E. W. (2018, August). Arbitrum: scalable, private smart contracts. In Proceedings of the 27th USENIX Conference on Security Symposium (pp. 1353-1370). USENIX Association. How can you scale smart contracts? Ed’s team worked on an off-chain protocol. The work is performed out-of-band by the transacting parties. The computation and storage are done off-chain. All of these things need to be linked back to the chain. Ed quickly summarizes approaches that have been taken, including SNARKs, Incentivized Verification (TrueBit), and State Channels. He goes more in-depth about TrueBit. In this system of incentivized verifiers, a group of “verifiers” volunteer to check computations. They are rewarded more if they find errors. Anyone can be a verifier, and the reward is split among them. If a computation checked by a verifier is incorrect, the verifier can give an efficient proof of incorrectness. But there’s a participation dilemma to incentivized verifiers. Imagine a game-theory situation where there are N players, who can pay 1 to participate. Imagine that a participating verifier pretends to be more than one verifier (sybils). In that situation, if you have enough people wearing different sybil masks, people are disincentivized from being a verifier. The creators of TrueBit have shown that their system is “one-shot sybil proof.” As a result, if someone claims to be two people, they get two shares of the reward, but the shares are smaller, so that it would have been more profitable to claim (honestly) to be a single party. Verification is a repeated game; in these cases, a verifier might sacrifice something in one situation in order to gain over long time. In their paper, Ed and his collaborators shared a game theoretic proof showing that every one-shot sybil proof participation game allows a situation where one verifier can bully all other players into not participating by flooding the system with fake verifiers. The Arbitrum system is built around Managers, who manage a virtual machine that carries out computation and data. Arbitrum provides an “any-trust” guarantee; as long as at least one manager of a VM is honest, the VM will execute correctly according to its code. Imagine that Bob and Alice are going to play a chess competition. They create code that holds the gold medal, receives alternating moves, verifies the validity of the game, and pays the winner. Bob and Alice put the code onto a VM. Who are the managers in this situation? Alice and Bob can be the managers, and so long as they can hold each other accountable, the contract will work. How can managers in Arbitrum cooperate to advance the state of a VM? Managers have incentives to agree unanimously about what a VM will do. If they all agree and digitally sign the assertion, the system accepts their assertions, since the system assumes that at least one manager is acting honestly. What if managers dispute the claim? A manager can make an assertion and deposit some funds. Another manager can challenge the assertion and also deposit some funds. If there’s a challenge, the system referees the dispute and takes the deposit of the manager that was lying. When a challenge happens, the asserter divides their assertion in half and the challenger must identify which half of the process was incorrect. Eventually, the dispute is narrowed from a large process into a single instruction. The system can then check the one-instruction claim to find out who’s lying. By dividing the dispute down to a single instruction, Ed says it’s possible to decide the dispute efficiently in a way that minimizes privacy leaks. He then describes the data structure in Arbitrum that stores the state of a program as a tree of cryptographically-stored information. Conventional virtual machines store code and data in ways that require logarithmic time to verify instructions. First, Arbitrum stores data in fixed sized “tuples” that can be arranged in a tree structure. Second, application code manages the tree rather than the VM emulator. In the typical VM, a single instruction takes O(log n) to execute. In Arbitrum, it takes O(log n) instructions to execute something but each instruction takes constant time. And because Arbitrum narrows down verification to a single instruction, resolving a dispute can take constant time. The state of a VM is revealed only to the VM’s managers– for example, Alice and Bob would be the only people who need to know what moves were made in the chess game. The only things that appear on the chain are: saltable hashes of the VM state, the number and timing of the steps, and the messages/money sent and received by the VM. The Arbitrum team has implemented this system with 6,800 lines of Go code, a VM emulator, assembler, and loader. They have an honest manager module that makes and defends assertions. Their proof of concept uses a centralized verifier for simplicity, but you could easily replace this pluggable module that allows multiple verifiers. They also have an Arbitrum standard library. How well does this scale? Ed describes an example contract, showing that at the high end, Arbitrum can work at roughly a million times the performance of Ethereum. Ed thinks it’s the only system that provides scalability, privacy, and a programmable modules for writing smart contracts. After the talk, I asked Ed if collaborations like this are common- ones that bring together game-theoretical mechanism design, cryptography, and algorithm/data structure design. Ed responded that most cryptocurrency work does combine these things. What makes Arbitrum unusual, Ed explained, is the way in which the research team re-designed the VM in a way that makes the protocol more scalable. It’s hard for people to keep all of those things in mind, and Ed says that it’s easy to get things wrong– which is why peer review is so important in cryptocurrency research.